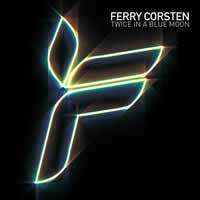 Ferry Corsten strikes again -- under a blue moon. The name "Ferry Corsten" is pretty well-known the whole world over. Okay, maybe not to mainstream North American listeners, but to the dance community, he is a very important and influential figure. He has hovered within the top ten DJs in the world for many years now, and is beloved for his overwhelming trance sets. But more importantly, he has released several well-regarded trance albums under the alias "System F", as well as under his own name. His last album, "L.E.F." (which stands for Loud Electronic Ferocious), tore up the dancefloors and surprised the masses with his new electro/anti-trance sound. Now Ferry's back with a new album, "Twice In A Blue Moon", which he declares as a step back into the world of trance with his own flavour. And this record's a pretty decent ride, with only a few bumps along the way. The album starts off in an electro-funky direction with Shelter Me, a track that mildly demonstrates the direction Ferry Corsten is now taking, if there actually is one. The melody is a bit somber and haunting, but mixed with a funky house beat, it retains its intentions as a dancefloor invader. He is beginning to sound more like popular electrotrance artists such as Sander Van Doorn and Marco V, and the result shows that he is capable of performing just as well as they can. Ferry has enough experience in the industry that he can make genre switches like that and still maintain a level of credibility and musical stability. Next up is, without a doubt, my favourite track on the album that hooked me from the start: Black Velvet. Aside from possessing a very slick finger-clicking beat, it features some smooth love-soaked lyrics, courtesy of Australian songstress Julia Messenger (whose website needs a bit of improvement). The vocals are not as far in the foreground as they could be, but perhaps that is where the simplistic charm lies -- not just in the cuteness, but in the subtle delivery! Some distorted melodic synths also round out the package. We Belong pulls a 180° on Ferry's style altogether, taking a page from the tomes of italo-disco instead of typical trance. With the vocals of Maria Nayler, he has created a strange disco-style electro track. Although it doesn't quite fit the tone of the album, it's a pretty decent dance break. Gabriella's Sky was named after Ferry's new daughter, Gabriella Skye. This song reminds me of the old classic trance songs that Ferry Corsten used to pull off in his older days, particularly the epic trance tune "Galaxia", under his alternate moniker, Moonman. That track is over 10 years old but it still very impressive. This new one does not impress me as much, but it holds the spirit of those old days. Boasting wavering pads and some swift electro bassline, it actually ends up being a bit more relaxed than many songs on the album. I come to this track less than many of the others, but I won't dismiss it entirely. Following this is Made Of Love, which follows in a similar vein to "Black Velvet". Originally an instrumental track which was tested in clubs, it was retooled with new vocals by the enigmatic Betsie Larkin. This one has a bit more straightforward power, ending up as a typical vocal electrotrancer, but still maintaining enough personality to keep it a step above the rest. Betsie's vocals also add a special atmosphere as well. Radio Crash is the first (and, as of this writing, the only direct) single from the album, and fans have gone absolutely bonkers for this one. To be honest, the first time I listened to it, I couldn't figure out what all the hype was about. Focusing on a fuzzy main melody and bassline, coordinated with a few tribal beats here and there, the track actually sounds less innovative to me than previous single releases. The song has grown on me a tad, it's true, but I don't really see anything particularly special about it. The title track, Twice In A Blue Moon, may aim to break that record, but in the end, it simply becomes another typically rad Ferry Corsten track that doesn't stand above or beyond the call of duty. It would not have been out of place two albums ago; it has a very similar sound to "Sweet Sorrow" from his 2003 album, "Right Of Way". It's still a good listen. The same goes for Feel You; the electro-trance isn't trying to be massive, but instead is content with simply holding a very cool sound. Nothing too fancy, just a smooth, entertaining listen. Life has that Marco V/Sander Van Doorn minimalist electro sound to it again, only this time, it sounds absolutely intentional. In the midst of this are bouts of male vocals, crooning about how life should be and how he is meant to be with whomever he has chosen to sing about. The vocals don't quite fit the song, let alone the album -- heck, they sound too forced and overdramatic anyway. But it's better than a track about cow mutilation, right? Next is Brain Box, which revives his direct electro sound from his last album, and actually, it's pretty infectious for such a simple outing. The bassline and main fuzzy synth complement each other quite well, and it does have the ability to make you feel like your brain is in a box. Huh. This track was also used as the Official City Race Theme 2007 in the Netherlands. I don't know much about that event, but it must now be 50% more awesome. YEAH! If you are a fan of Indian music, perhaps the sounds within Shanti will be more up your alley. Ferry Corsten used a rare sample from one of his synthesizers to imitate the sound of a person singing in tones often employed in Indian/Eastern music. But this sample is the main catch to the track; behind it actually lies a fairly mediocre song otherwise. I guess this is known as a musical gimmick, yes? I might listen to it on occasion, but I'm usually too busy enjoying "Black Velvet" to remember that this one even exists. Moving on... Last but not least is a two-minute chill-out number entitled Visions Of Blue. Indeed composed by Mr. Corsten himself, there is heavy reverb and a melancholy piano melody that plays throughout, leading to an unhappy end to what should be a very upbeat album. Ah well.